Colonel Young's opponents launch a coup to take control of the ship, pitting the military against civilians. Haunted by her experience as an alien captive (“Space”), Chloe Armstrong awakens from another dream. She roams Destiny‘s corridors, ending up in the mess hall. There she finds an equally haunted Dr. Nicholas Rush. He confirms her fear that their captors will be back. Rush is certain the aliens have been tracking Destiny for a very long time. He approaches Colonel Everett Young. But Young is focused on why he swapped bodies with an alien when he used the communication stone. He accuses Rush of having one of the stones on him when captured. Rush does not deny the accusation, even as he suggests taking advantage of Destiny‘s drop out of F.T.L. to search the exterior hull for subspace tracking devices planted by their new enemy. A kino sent through the hole the aliens cut in Destiny‘s hull in the recent attack finds a small alien ship attached. With an hour left before the jump to F.T.L. flight, Young and Lt. Matthew Scott take the shuttle and destroy the alien vessel. They dock with eight minutes to spare, but the shuttle clamps will not engage, nor will the door open. If not locked onto the hull, the shuttle will be vaporized when Destiny extends her shields before jumping. While Eli Wallace’s attention has been focused on the shuttle mission, Rush and I.O.A. representative Camille Wray initiate a civilian coup. Rush converts a research lab into a new control room by transferring systems files and controls. When Eli attempts to manually activate the shuttle clamps, he realizes he is locked out. Chloe, who is there with him, is equally upset. Aware of the dwindling time left before the jump (and aware of the coup plan), she runs to Rush’s lab. She reminds him that no one was supposed to get hurt in executing their plan, and demands Rush stop the transfer that is seizing control of the ship’s functions. Rush hesitates, knowing this will compromise their plan and leave some systems in the hands of the military. But Wray also insists he stop the transfer; if Young and Scott are killed, they will lose the support they have among the ship’s civilians. Rush stops the computer transfer and allows Eli access to lock down the shuttle clamps in time. The shuttle is secured seconds before Destiny jumps. Unable to contact Rush, Young orders MSgt. Ronald Greer to locate him. As Greer’s team approaches Rush’s lab, bulkhead doors close and lock, preventing access. Military personnel are isolated from the civilians – with two exceptions. In the hydroponics lab Lt. Tamara Johansen, checking on medicinal plants, is trapped with civilian scientists Adam Brody and Dale Volker. Airman Dunning is also in a corridor in the section, along with several other civilians. Wray informs the two military personnel, Johansen and Dunning, that the civilians have taken control of Destiny because they believe Young threatens everyone’s survival. Civilians now control the food and water on the ship. They want the military to hand over their weapons and submit to civilian authority. But Eli shows Young that they still have control of life support on their side of the line. Rather than trying to outlast one another, the two sides agree to an exchange: the civilians trade a small amount of food and water for Eli himself. Rush knows that Eli is the Colonel’s best chance of recapturing control of the ship’s systems. When Chloe welcomes Eli onto their side, he realizes that she is complicit in their action — and suspects that she may have been trying to distract him from seeing the computer transfer in the lab. But she denies it, saying that she knew the coup was coming, but not when. Rush also tells Eli that he needs his help to help strengthen Destiny‘s shields before the aliens attack again – something he believes is imminent. Eli balks until Rush reveals that Rush himself was surgically implanted with a tracking device while on board the enemy ship. Destiny has inexplicably dropped back to normal space. Seizing the moment, Young and Greer don space suits. They enter civilian territory through the hole the aliens cut in the hull, just as three alien ships appear. Rush dials up power to the shields. If Destiny can withstand this one attack, he believes the aliens will realize that they can’t take the ship. Eli is unconvinced. The aliens open fire. As Young searches for Rush, Greer opens one of the sealed doors to give Lt. Scott’s strike team access. They quickly retake the civilian-held areas, freeing T.J. and Dunning. 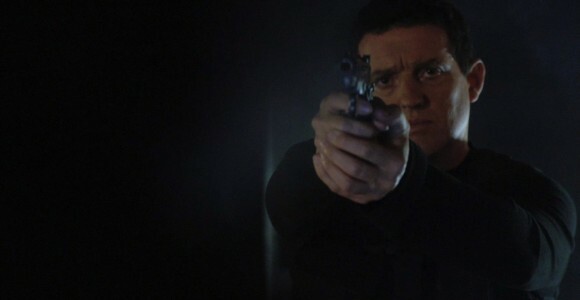 Reaching the lab, they find Young pointing a gun at Rush’s head. Rush has locked everyone out of weapons control, believing it will needlessly waste power required by the shields. When Young orders Greer to take Rush away, Eli tells the Colonel about the tracking device inside Rush. Even if the ship survives the current assault, the aliens will just track them again the next time they come out of F.T.L. Young orders T.J. to remove the device. Using a communication stone, Chloe swaps bodies with Dr. Brightman (SG-1: “Lockdown”). Eli has attached a kino camera to a flexible tube to serve as a makeshift scope for the surgery, and Rush is rendered unconscious by an anesthetic T.J. created from the venom of an alien creature (“Time”). The doctor begins the dangerous procedure as weapons fire continues to rain down on the shield outside. Eli circumvents Rush’s lockout and gains control of the weapons, but he is afraid they will drain necessary power from the shields. If they hold on, Destiny will jump to F.T.L. flight when its countdown clock reaches zero. But the sustained alien firepower continues to weaken the shields to dangerous levels. In the middle of the surgery, the body-trading connection between Brightman and Chloe is severed — apparently due to interference from the weapons fire on the shields. Chloe finds herself performing the procedure. To make matters worse: Rush starts to regain consciousness. There is still a minute left before Destiny jumps. The shields are almost gone. As more anesthetic is administered, T.J. removes the tracker from near Rush’s heart. Scott smashes it as several of the alien shots break through Destiny‘s shields. But the ship finally jumps to safety. In control of the ship again, Colonel Young enters the mess, where the civilian population is gathered and under guard. He tells everyone that the coup is over. He and Wray agree to move on as if it didn’t happen, but she tells him he should never have left Rush on the planet. Even as Young acknowledges the mistake, he knows nothing has truly been resolved. The song during the episode’s opening montage is “You Won’t Know” by Brand New. “Divided” was originally intended to be the mid-season premiere of Stargate Universe, following “Space” as the second half of a two-parter. When “Darkness” and “Light” were expanded to two episodes, “Divided” was bumped back to the number 12 spot. “Quite a few of you want to see more of Eli Wallace (David Blue), find out a little more about how his mother is doing, and see the character mature a little over the course of his incredible adventure aboard Destiny. Check, check, and check although, admittedly, the latter requires us to walk a fine line between having the character mature over the course of his experiences yet keeping him the grounded, fish-out-of-water the viewer can continue to identify with. “One thing you are going to see is the divide being to form onboard the ship between the military and the civilians and surprisingly enough my character turns out to be a part of the creating of the division. And I think some pretty big stuff happens to her right off the bat which changes her in ways that aren’t apparent at first but reveal themselves over time. And we’re going to see I think her sort of lose herself a bit and sort of searching to find her place on the ship more and more and starting to lose trust in the people that she used to trust and count on sort of maybe some crossing over to the other side, if you will. VOTE! 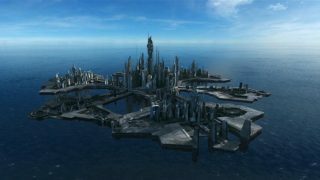 How would you rate SGU's "Divided?" Stargate In 2019: What Happens Next?